From L to R: Gandalf, dwarves Dwalin, Bombur, Bofur, Bilbo Baggins and dwarf Balin. Wow, that beard/hair combo on the end as well as that short dark brown beard are delicious! The torsos look to be pretty excellent as well!! Last edited by AK_Brickster on Thu Jul 12, 2012 9:26 pm, edited 1 time in total. I find Bombur, Bofur, and Balin's headgear/hair to be a bit odd to say the least(especially Bofur's). I think Dwalin is my favorite of this bunch, I really like that torso and beard. Bilbo's ok, but he looks to much like the other hobbits to be anything special. As far as I can tell gandalf is the same unless there's something hidden under his beard. Yes, some of them are a bit strange, to be sure. I'm guessing that they modeled them after the characters as they will be portrayed in the upcoming movie. Now I just wish that TLG would start making some hair that would better go with these dwarf beards. Most of the ones that are currently compatible are either too neat, or too "poofy" (like the HP hair). At least we are getting a few new beard types with these guys, which is always a good thing. Also it looks like we'll be getting the short legs in a few new colors, if I'm not mistaken. Last edited by AK_Brickster on Mon Jul 09, 2012 10:19 pm, edited 1 time in total. New beards and castle torsos? Yes please! These look great, loving the dwarves. I just saw the trailer for the Hobbit at the theater today and those dwarves look spot on. I like the new beards. Dwalin's looks like is meshes best with the Fantasy Era dwarves. Balin's reminds me of the hair beard combo Arealight once produced and it'd be great it that piece shows up in other themes in different colors. Is it just me or does Bombur's beard look like there is a piece in between the braids of the beard to make him look like he has a belly? DARKspawn wrote: New beards and castle torsos? Yes please! These look great, loving the dwarves. Definitely agree! These parts will add some much needed variety in castle MOC figs. New hair pieces are always cool. I'm the kind of person that feels like all figs need headwear. Hat, helmet or hair. lord_of_orks wrote: I find Bombur, Bofur, and Balin's headgear/hair to be a bit odd to say the least(especially Bofur's). That was exactly my reaction. They definitely are...odd, but I would assume they're after the movie interpretation, and variety is good. Quickblade22 wrote: Is it just me or does Bombur's beard look like there is a piece in between the braids of the beard to make him look like he has a belly? If these figs are all in one set I want it! The dwarf design from the hobbit film trailer is a bit wacky, but I guess needed, to distinguish the characters throughout the film. Rather than just being 'that dwarf with the slightly bushier/browner beard etc. The figs look spot on to these designs. As mentioned, the short beard looks the most reusable. My only fear is that these sets are going to be so expensive with all these new moulds! Cool! I'll probably be after these for the new beards if nothing else. I especially like the braided one. I read somewhere else that that was the case. A bit disappointing, as it means that you can only use that beard with certain colored torsos. I'm also not convinced that they pulled off what they were trying to do all that well, but will prob need to see better pics that show the profile a bit better. For some reason, whenever I look at Bofur's hat, it looks like a fuzzy alien is jumping at me. The torsos look excellent. Might have to pick whatever set this is from up, when it comes out. Over on Eurobricks, somebody posted a link to a high-resolution version of the picture. Of the Dwarves, I think I like the looks of Balin the best - certainly his beard will be the most useful, and I think it's be mostly-compatible with a couple of TLC's newer hairpieces. If you look closely at Bombur, it almost looks like he's got a belly piece and a beard with a printed shirt design. That would fit with certain other rumors I don't know if I'm allowed to talk about, but it makes him a little less useful overall. I've never liked the "Yooper" look for Bofur, but at least his head and torso look fairly generic. Actually, all of the Dwarf torsos we can see look fantastic. Dwalin's hair/beard could go either way - ideally I'd like to get ahold of one in person. 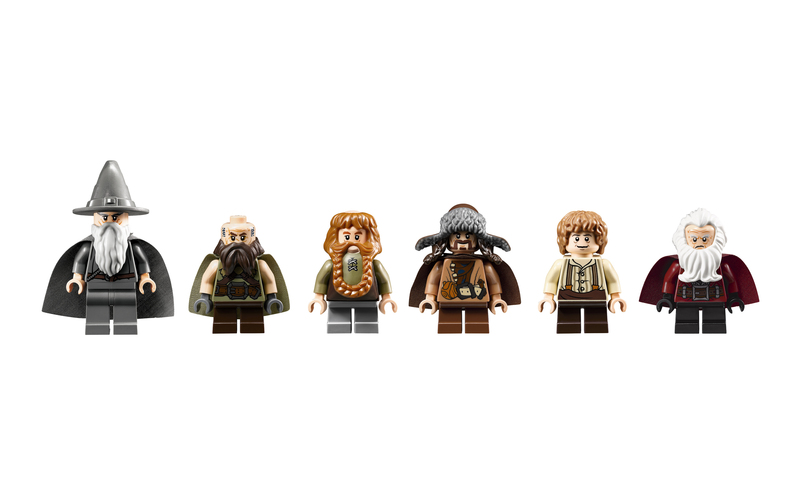 On that note, I've read some speculation (again, Eurobricks) that these are the minifigures from one set in particular, probably the Bag End set. That makes sense to me, but based on these minifigs I fear that the pricepoint may be closer to Weathertop than the Uruk-Hai Army. I agree with many of you. The headgear/hair is hit and miss with some great parts, but the torsos are incredible! Can't wait to see the other dwarves. I especially like Bombur's hat. Edit: Of course I mean Bofur, Bombur doesn't have a hat. Last edited by questforcastle on Mon Jul 23, 2012 4:00 pm, edited 1 time in total.